When was the last time you did something for the first time? I love this TV ad from Emirates a few years back. The message is inspiring and it also ignites a certain sense of drive - to put some goals and dreams into action. On another note, it can also push one to try something new - whether it be by choice or when one is pushed against a corner. At home we have our schedule and timing all synchronised. The day doesn’t have to start in a flurry but usually on weekdays, it does. The few minutes before we need to be out the door consists of dressing up, prepping lunch boxes, breakfast, packing up, brush teeth etc. Etc. We have this under control until something, or someone slips a few seconds behind and this will rock our world entirely. Well not to that extent, but can pump adrenalin into me like The Road Runner. So let me tell you about this day – when my teen misses the bus by a few seconds. Usually, I take her to the nearest bus stop with the other girls, still in my pajamas (usually PJs and a shirt with just a hoodie a wallet and a mobile phone). And so this day when she missed the bus, I had to follow the bus route with the hope of reaching the next stop just in time, but was unlucky. And so we had to take her to school – pajamas and all. And the unlikely scenario happened of course – we were running out of petrol on our way back home. And so the Emirates ad “when was the last time you did something for the first time” came to mind. Pajamas and all – I was there pumping petrol surrounded by what then seemed to be overly-dressed-suit-and-tie-folks with the morning rush hour traffic passing me by, and I am whistling a happy tune. La-di-da-di-da.... NOT! Well, its not a big deal really, but when you still have to make/eat breakfast, shower and dress, remind the girls brush their teeth, brush and tie the girls' hair, take them other to school then drive yourself to work and you've just cut back your schedule for a good half an hour, then adrenalin does kick in. Whoosh, whoosh, whoosh. Don't forget the lunch boxes, the cello, the backpacks! Wait! My bag! Quick! Quick! Quick! I tell you, my heart starts beating normally as soon as everyone is in the car. It's a weekly cycle really. The routine pretty much works except that is, when something or someone slips. So you can imagine how much the two-week school holiday means to us. IT'S A BIG DEAL! Two weeks of extra hours of sleep, no lunch box to prepare, no after school activities to go to. Just slow and calm mornings. Because of work commitments, we don't usually go out of town during this 2-week break but the short break is enough to recharge everyone's energies to welcome the next term with great enthusiasm and joy. Now back to autumn and the season for apples, pears, figs, and plums! All great fruits we love eating at home fresh. But for this month's theme at Sweet Adventures Blog Hop hosted by 84th and 3rd (check out her fresh apple cake - made with coconut oil! ), I'm adding some pears to our go-to flourless chocolate cake! 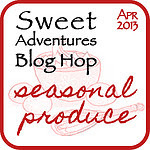 I love blog hops because its a great way to tweak old recipes and try new ones! This Flourless and Pear Chocolate Cake is inspired from BBC Australian Good Food magazine which has ceased publication last year. The good thing is, I kept most of my old issues. Line the base of a 20cm loose-based pan with baking paper. Brush the bottom and sides with the extra butter. Sprinkle the extra sugar on the base and sides of the pan. Tip out excess. Melt the butter and chocolate in a bowl over a pot of simmering water. Set aside to cool. Using electric mixer, beat egg yolks and sugar together until pale and thick. Fold into the melted chocolate and add the almond meal. Using an electric mixer, whip the egg whites until you get soft peaks. Fold into the chocolate mixture in two batches. Pour into the prepare pan. Top with the pears, cut side down. Bake in the preheated oven for 30-40 until pears are soft and cake is cooked through. Place in a cooling rack and dust with icing sugar. * I used Corella pears because they're small and it will fit the pan size that I used. I cut two pears in half, and the third one was quartered. * The pears were not as soft as expected but they were soft enough to slice with the cake. You can poach the pear separately before making the cake if you prefer a softer fruit. Check out this Upside-Down Pear Cake I made before. * I've made another batch of this cake but poached the pears with Maggie Beer Sangiovese Verjuice which is sweet juice of unfermented grapes, no sugar just the verjuice. I chose this because I didn't want to do a white-wine-cinnamon-anise-sugar-poached pear, as I wanted the pear to retain their natural sweetness to complement the chocolate cake. * You can spray the pan with canola oil instead of brushing it with butter. This was gone in a flash! Literally! While the cake was cooling, my taste testers kept coming down to check in the kitchen. They could not wait! One of the few cakes with fruits which they actually loved! The girls said they love how it tastes a lot like brownies! Now that its the school holidays, we might be making more of these. What a lovely cake, pear and chocolate are a winning combination in my books. I laughed at your drive to school incident. I too enjoyed the less frantic mornings of school holidays and was not thrilled to have it all start again this morning. Can't wait to make it Bambi! I can turn it into a paleo cake by substituting honey or coconut sugar for the refined sugar! Sounds and looks delicious. Thank you for sharing. I'd like that red wine too JJ! And yeah, the mini-me's keep me on my toes. There's never a dull moment. Love the pear and chocolate combination. I feel your pain regarding the morning rush. Holidays don't start till next week here and I am soooo looking forward to it. Particularly the slower mornings. The top down picture of the cake is perfection! I wanted to dive in, mouth first. I cannot tell you how envious I am of Marco and Gordon! I'm rocking a little handmixer at the moment and looking wistfully at Kitchen Aids online.